The Dallas Cowboys, Federación Mexicana de Fútbol (FMF), MLS' FC Dallas, and the Dallas Sports Commission announced today a landmark sports partnership that will bring the popular Mexican National Team U.S. Tour to North Texas through 2022. The agreement, facilitated by FMF's U.S. partner for the past 16 years, Soccer United Marketing (SUM), was made public today at a news conference in Arlington, TX that included FMF General Secretary Gilberto Hernández and Cowboys Executive Vice President/Chief Sales and Marketing Officer Jerry Jones Jr.
"With the Dallas Cowboys fan base in Mexico, and the Mexican National Team being one of the most popular teams here in North Texas, we are excited for the opportunity to host Mexico at AT&T Stadium for years to come," said Jerry Jones Jr. "We are thrilled to continue to engage these incredibly passionate fan bases with two premiere sports brands at one the best stadiums in the world." Since opening in 2009, AT&T Stadium and North Texas has become a second home for the Mexican National Team; el Tricolor have played seven games at the Cowboys' home - a facility Mexico inaugurated – and have enjoyed a winning record of 5-1-1. The squad last played in Arlington against Croatia as part of its 2018 U.S. Tour. "We are very pleased to enter into this partnership, not only for the opportunity to collaborate and exchange ideas with important colleagues in the sports industry, but also for the chance to bring the Mexican National Team closer to its fan base, which for years has demonstrated its passion and commitment to the team," said Gilberto Hernandez. "Soccer United Marketing is proud to facilitate this multi-year partnership between the Dallas Cowboys, the Federación Mexicana de Fútbol, FC Dallas, and the Dallas Sports Commission," said Gary Stevenson, President and Managing Director, MLS Business Ventures. "This unique relationship will elevate soccer's popularity to even higher levels in North America and create new opportunities to celebrate the sport and its unique culture in a perennial sports and entertainment hub. We're thrilled to work with partners committed to advancing the game, growing participation, giving back to the community, and providing unparalleled soccer experiences." "Mexico has such a large fan base in Dallas/Fort Worth," said FC Dallas President Dan Hunt. "We're thrilled to help host the team and further establish the region as the premier home for soccer fans from around the world." 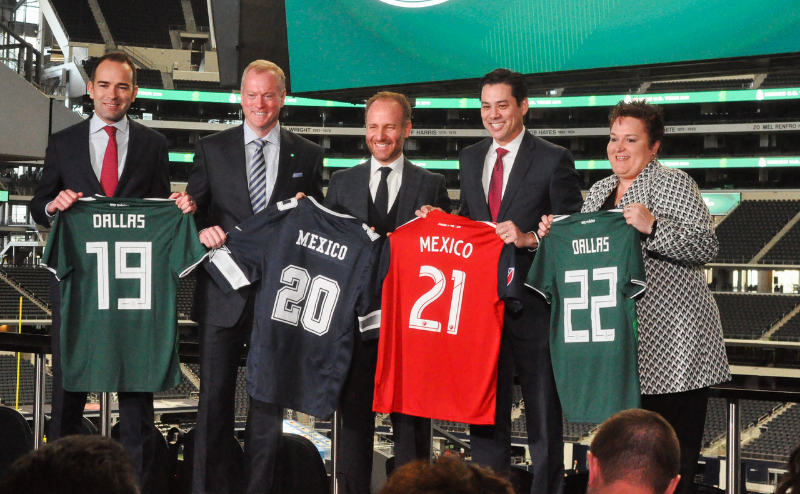 "We look forward to welcoming the Mexican National Team to Dallas and North Texas over the next four years as their home away from home as we further expand the impact of soccer here locally," said Monica Paul, Executive Director of the Dallas Sports Commission. "Whether it be through the fan fest, reading programs, and other community initiatives, we are excited about the opportunity to celebrate the culture and sport of soccer as we continue our quest to be a 2026 FIFA World Cup host city."